The Latino National Republican Coalition of Virginia | Virginia Right! 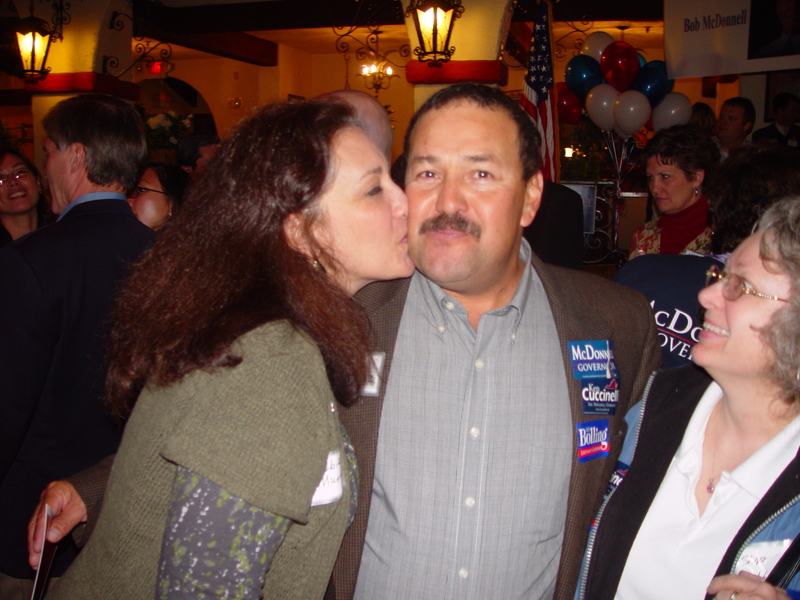 I was invited to a meeting of the Latino National Republican Coalition of Virginia that took place yesterday in Reston, Va. During the 2009 election cycle I was fortunate enough to become friends with Tito “The Builder” Munoz and his wife Deborah. If you don’t remember Tito, I have included a video of him appearing on Hannity and Colmes on the FoxNews Network at the end of this post. This interview is an all time classic. 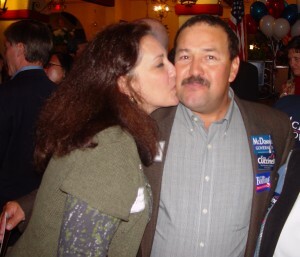 This couple worked tirelessly for the McDonnell campaign with an eye on reaching out to the Latino community. But they reached far more than the Latino community. While it is impossible to say exactly how many people were influenced by this “power couple” in 2009, I have no doubt that Bob McDonnell’s historic margin of victory included a large number of votes from the Latino community who trusted the judgment of Tito and Deborah enough to bring victory to Bob McDonnell and many other races on which they worked. Tito and Deborah own a Construction Company and know how to build bridges out of concrete and asphalt. But the true monument to the Munoz accomplishments are not the ones made of concrete, but the ones made from words and actions. While many see the work they do as reaching out to the Latino community, the truth is, these are two way bridges. They are simultaneously reaching into the Conservative population and changing the perceptions of many Conservatives. The Latino community is not one entity. They are from many diverse countries, each having their own rich history and each bringing their own cultural enrichment into the Great American Melting Pot. But there are many common threads shared with “natural born” Americans. In particular Conservatives. Most have a foundation built on a love of God, strong family bonds and a desire to work and make their own way in life. But what I have come to realize is many have witnessed first hand the failures and loss of freedom brought about by the Socialists and Communists that have devastated the freedoms of these proud people in their birth countries. Their love of freedom is what brought them to the United States. They studied hard, learned English, learned the US Constitution and had to pass a test to become citizens. For those of us that were born here, we are Americans by birth. We are not required to take a test. No effort is required at all. Many natural born Americans have become complacent, and take what we have for granted. Not these Americans. Not the ones that had to study, learn and work for the right to say they are Americans. Not the ones that chose to be Americans. Not the ones that were forced by the government to jump through hoops natural born Americans can only imagine. No, they earned the right to be called US Citizens. They worked far harder than I ever had to for this right. And many natural born citizens look down on these Americans and discrimination is everywhere. But the determined nature of these Americans is tempered by a first hand knowledge how bad things are under a Socialist regime and how important freedom really is. And they shake off the discrimination, they do not cry about it, they simply see it as another obstacle to overcome. I love my country. I love my freedom. But my Latino friends have sounded the alarm that the “Progressives” who have taken over the Democratic Party have us on the road to a complete loss of freedom and are intent on making America another failed experiment in Socialism in the mold of Fidel Castro in Cuba and Hugo Chavez in Venezuela. And they are absolutely right! The Latino National Republican Coalition of Virginia is part of a National group that is uniting Americans to keep our Country free. This group is using the legendary passion and fire Latinos are known for to ignite a fire in all Americans. Not for armed revolution, but for a grassroots effort to educate and reach out to ALL Americans and awaken the pride and love of freedom the “Progressives” wish to kill. This Coalition has some of the most American leaders, the likes of which this country has not seen in over 200 years. The Virginia chapter is working on a call-in radio show, in Spanish, to help with the education. While Latinos have traditionally voted Democratic, that party has used and abused them, and has now moved so far to the left, thanks to the “Progressives”, that they are now a Socialist party. A radio show takes money, and the Coalition is planning a number of fund raising opportunities beginning next month. Additional details will follow on this blog. While this group has a number of passionate leaders from the Latino Community, it was a distinct honor and privilege to meet Federico Morales who is a National Committeeman for the group. At 75 years young, Mr. Morales has a long history of advocating for freedom. His birth in Cuba tells you all you need to know about this important American leader. It will take all freedom loving Americans working together to defeat the “Progressive” threat, a threat that just as dangerous to Americans’ freedom as Al-Qaida. While “Progressives” may not knock down our buildings, they have already knocked down our economy and pretend it was the fault of the previous administration. The Latino community is one of the greatest allies of freedom this country has. We all need to welcome and embrace their efforts. Working together, we can accomplish our goals much faster. But make no mistake. This is one group of Patriots that is focused on a single goal: Freedom. You can either join them, or get out of the way. There is no other option. Me? I will stand with them. We are already on the same team. Always have been. Please watch this interview if you have not seen it. It is priceless! I've always been confused when I hear a Socialism v. Freedom argument. As far as I can tell, the two aren't mutually exclusive. Freedom does not shut the door on Socialism, nor does Socialism outlaw freedom. It is possible that both can be USED as a tool against the other, but it is not an either-or. Most of the examples I've heard of Socialists countries repressing Freedom have been more or less Totalitarian States. And I WOULD say Totalitarianism and Freedom are (almost always) against each other. However, Socialist (or semi-Socialist) systems that are not Totalitarian do not exactly repress freedom. I haven't seen a convincing argument that Europe (which is arguably more Socialist in it's policies than the United States) is necessarily "less free" than America because of Socialism. I'm not trying to advocate Socialism at all in this post, but my point is we routinely make glittering generalizations on values. The thinking is conventionally Liberty -> Freedom -> Democracy and Socialism -> Totalitarianism -> Communism. However, to really analyze the direction of the country, we have to start detaching those links and looking at each value separately. Is there something wrong with the comments? Mine are getting deleted the second I put them up. Weird, whenever I try posting what I want to say, it gets deleted, but this goes up fine. Love Tito and Debbie and will work with them to reach out to the Hispanic community. This was posted by Bigvinu and for some reason does not post. It is not marked as held for approval, nor is it marked as spam. But they do show up on my dashboard and I had to select reply to see the post. I am posting this on Venu's behalf. He is a welcome visitor, but we often have opposite sides on issues. But he always welcome to post here. Well, the major problem I&#39;ve had with a lot of these Socialist arguments from the Right is that &quot;Socialism&quot; and &quot;Freedom&quot; are intrinsically opposing values. However, that is not necessarily so. The two are not actually mutually exclusive. The leading arguments (or at least the leading arguments I&#39;ve heard) deal with the fact that Socialist countries are by default Totalitarian. That however, is no true. Now the argument CAN be made that Totalitarianism is naturally opposite to Freedom by virtue of Freedom guaranteeing liberty to all, and Totalitarianism making that liberty conditional on the willingness of the Government. However, I&#39;ve not heard a convincing argument that Europe (which is arguably more Socialist in their policy directives than the United States) is &quot;less free&quot; than the United States. Typically when we discuss these values, we tend to make glittering generalities about them and link them together. For example: Liberty -&gt; Freedom -&gt; Democracy. Or Socialism -&gt; Totalitarianism -&gt; Communism. Those are just example of course, not meant to stereotype Conservative thinking. However, to truly analyze the direction of this country, we have to detach each of those values from one another and look at them independently. Does Socialism necessarily lead to Totalitarianism? I don&#39;t really see a convincing argument to be made regarding that. Great read. I am sorry that I was working on other business on Saturday. Would have been great to have met you all. I’ll be pulling for you, pushing for you out in Loudoun. I am very thinkful for Tito and Debbie. We will all make a difference in the immediate years to come. I’m happy to have added VaRight to my blogroll. Well, the major problem I've had with a lot of these Socialist arguments from the Right is that "Socialism" and "Freedom" are intrinsically opposing values. However, that is not necessarily so. The two are not actually mutually exclusive. The leading arguments (or at least the leading arguments I've heard) deal with the fact that Socialist countries are by default Totalitarian. That however, is no true. Now the argument CAN be made that Totalitarianism is naturally opposite to Freedom by virtue of Freedom guaranteeing liberty to all, and Totalitarianism making that liberty conditional on the willingness of the Government. However, I've not heard a convincing argument that Europe (which is arguably more Socialist in their policy directives than the United States) is "less free" than the United States. Typically when we discuss these values, we tend to make glittering generalities about them and link them together. For example: Liberty -> Freedom -> Democracy. Or Socialism -> Totalitarianism -> Communism. Those are just example of course, not meant to stereotype Conservative thinking. However, to truly analyze the direction of this country, we have to detach each of those values from one another and look at them independently. Does Socialism necessarily lead to Totalitarianism? I don't really see a convincing argument to be made regarding that. Socialism is not the final destination, it is a stop on the road to Communism. I am working on a post that will explore this in greater detail for later today, time permitting. While the US has some elements of Socialism, most of these are more a result of the generous nature of this country, such as welfare. The more commonly used examples like Social Security and Medicare – not so much Socialist. I am paying for mine now, and will collect later, hopefully. The part of these programs that is Socialist is that they are mandated by the Government. I do not have the freedom to “opt out”. When Social Security was started, many said it opens the door to Socialism. It did. This wonderful and popular program has ushered in a slew of other “popular” Socialist programs. And the argument that these “Socialist” programs are popular is a dangerous argument. If Obama decided to force all Best Buy stores to open their doors and give away everything in the store, or banks to open their vaults to the public periodically, they would be VERY popular. People would love for them to be expanded. Cars, boats, whatever. The businesses would then need to buy more inventory. Good for the economy? If this idiotic idea were to become the norm, what would the merchants have to do to cover the losses? Raise prices or go out of business, right? It is the same with all social programs. When the government controls everything, bad things happen. But it will eventually reach a point where the productive portions of society give up and join the unproductive in living off of the government. At that point, the government can no longer provide and a revolt by the people occurs. Ask my Latino friends. They have seen this first hand. The military becomes the barrier between the people and the elite rulers. Blood must be shed to take back the country. America is different. We are all armed – or should be. The 2nd Amendment was to keep the government from even thinking about taking our freedom. The Posse Comitatus Act keeps the military from being used to suppress the people. The dangers of out of control governments were foreseen. We have the ballot box. It was used wisely in Massachusetts. Socialism is an erosion of freedom. Erosion created the Grand Canyon. How much erosion of our freedom is acceptable? The obvious answer is none. Zero tolerance. We already have far too much. Freedom includes the freedom to do stupid things. The freedom to fail. Seat belts, motorcycle helmets, and other nanny laws erode our freedom. While I am smart enough to always put on a seat belt, and if I rode a bike, I would put on a helmet, it is wrong for the government to mandate this. But it is UNCONSTITUTIONAL for the FEDERAL government to get this involved in our lives. While these laws limit freedom, they are Virginia laws and are permissible. Socialism, no matter how popular or well intentioned is unconstitutional and must be stopped at all costs. But, just as you pointed out, even the United States has some Socialist elements to it. They are not intrinsically opposed to our freedom. You can make the argument that as you accelerate down the Socialist path, you run the risk of allowing for a more Totalitarian state to exist, thus destroying our freedom, but the point I’m trying to make is that it’s not Socialism that is directly opposed to freedom. On a side note, seat-belt laws are state laws. And yes, it is OK to take away personal freedom when your freedom specifically threatens another person’s. Going back to your post on the Smoking Ban, you yourself made the argument that 1 person should not have the freedom to take away someone else’s freedom. Now, talking about the seat-belts, is it free for a person to forgo the seat-belt, get into an accident and now indirectly charge all of us for the emergency care? And no, I do not believe Socialism is outright unconstitutional. Socialism, in it’s most basic form, is designed to at least mitigate poverty. Now, I do see the problems of going over-board Socialist and getting a giant segment of the population dependent on Government aid, but (playing devil’s advocate here) would it not be beneficial for the country as a whole to mitigate poverty as to prevent a widespread strain on the society caused by a slew of homeless and jobless individuals? I remember reading Alexander Hamilton’s writings in the Federalist Papers a few months ago as part of some research I was doing, and it struck me how “Socialist” he would seem by contemporary standards. Hamilton was arguing for support of the Constitution by saying that the Government would be constructed not only on the basis of Defense, and other standards of a government, but also “philanthropy” towards its citizens (and others). This, coupled with the fact that the Constitution was partly ratified to protect Societal welfare, leads me to believe that the Constitution itself does not necessarily frown on social programs for the poor. Then again, the Constitution also (as you said) would be against Totalitarianism brought on by extreme-Socialism for obvious reasons. But my point is that Socialism is not intrinsically opposite to the Constitution and to the Freedom. Well, as far as the seat belt and who pays for the care, Socialistic policies dictate we all must pay. Socialism means we let the person off the hook. I say he should be held financially responsible so we don’t have to pay. Compassion dictates we treat him, socialism dictates we must pay for the treatment. Take his house, take his cars, his possessions. Garnish his wages. If we did that, we wouldn’t need seat belt laws. People would buckle them. But there is no consequence because of these socialist tenancies. Exactly. By depriving me of my hard earned dollars to pay for someone that does not support themselves. My freedom to spend my own money as I see fit is taken away. THIS is socialism and our country is FAR worse off because of the supposedly “compassionate” side of this welfare socialism. When I was a young child, there was very little help available from the government if you lost your job, or fell ill. So how did people survive? Neighbors. We cut their grass, painted their house, took turns inviting them to eat, or made covered dishes for them. Churches pitched in. Everyone worked to find them a job. Now, we don’t even know our neighbors. And if someone falls on hard times, who cares? We have delegated our human compassion to the government. File for unemployment. Get food stamps, WIC. We don’t even need to know them. Because the government is a surrogate for our conscience. The introduction of welfare ended all of that. We no longer care. We pay taxes instead. The money we used to spend helping our neighbors and friends is now taken away and distributed as the government sees fit. Socialism masquerades as compassion, but it robs you of your humanity. It is a dark deceiver. You have been taught that only the government can mitigate the poverty and suffering. Has it? Hell no. It breeds more poverty and suffering as people lose humanity, and decide this is a right. To have others support you. Decades ago, you appreciated your friends, family and neighbors help, and you would never take advantage. Today, it is an entitlement. Everyone milks it for all they can. Not everyone, but millions. As we grow wealthier as a nation, the definition of poverty changes. Today, a welfare recipient can have cell phones, cable TV, and cars. They can smoke cigarettes and buy beer. And we reward them for bringing more children into this. It is a system designed to be taken advantage of. You are too young to remember how things were. I knew the names of every person on my street, and they all knew me. If I skinned my knee, I got free medical treatment from whoever happened to be looking outside at the time. The statistics all say the number of single parent homes are at unprecedented levels. I say there are very few. Almost every home has a Mother and a Father. Unfortunately, the father in many of these homes is the government. The bread winner. I remember humanity. And I miss it. And if you think Hamilton was a Socialist, take a look at Thomas Paine. Fortunately, these views did not prevail and were defeated as there was a danger of creating an entire class of people dependent on Government for their lives. Socialism has already destroyed our freedom, personal responsibility and our human compassion. It has made us cold, impersonal creatures. But by the argument that your money is going somewhere else, should we stop constructing roads, paying for schools, or funding the military? No, because it is to society’s benefit for these programs. And we must logically pay for what we want to do. I have always liked the argument that the Government is just an entity representing the collective people (at least our system of Government is). By that comparison, social programs are just neighbors taking care of neighbors on a bigger scale. It’s been a while since I’ve looked this up, but I believe the average time spent on welfare is 6 months. Most people on welfare are not freeloaders, but people that have to feed kids, take care of family, etc. Now, I probably think you’re right that the sense of community is leaving America, but that’s almost beside the point. Also, this leads to another discussion of what is and isn’t defined as “Socialism”. Are basic societal programs defined as “Socialism”. I’m not aware of a just society that has thrived that did not “spread the wealth” in some form (Even paying taxes to a government that builds schools is an instance of “spread the wealth” on some level). Ahh, my friend. You miss the point. Virginia building schools and roads is what the founding father’s wanted. Mass. has Socialized Medicine. I think that is great. The people wanted it and the state passed it. And if Virginia decided to go that route, fine. They already do for children. By definition, this is not Socialism because our Democratic Constitution allows it. Just not at the Federal level. Now here’s the difference. If Virginia decided to vote to pass a law I didn’t like, I can pick up the phone and call Chris Peace, my Delegate and he will personally speak to me about it. I can call Ryan McDougal, my Senator and he will also personally speak to me on it. I do have input and my access is not unique. They are close to us and we have very easy access. Eric Cantor is another story. I can write his office an email, but it is not very likely he will have the time to speak with me. And US Senators in Va – forget it. The point is, if Virginia wants social programs, fine. If Washington wants them, hell no. I agree a society needs these things. A safety net, if you will. But while it is true a large number of people move in and out of welfare, about 90 percent of those currently on the rolls will eventually spend more than 24 months on the welfare rolls and 76 percent will receive welfare for longer than five years. About half that go on today will be off in 2 years, but many stay for a long time. And I am not sure how you look at someone who is uninsured as costing the system so much when they need medical attention. Sure the final bill might be $30K or more for things, but the only thing the “dead beats” failed to pay was a monthly premium. We still must cover the bulk of the bill. So giving someone “affordable” insurance, say $50 a month because they are poor is only an illusion of participation. That paltry token is but a small drop. When I must pay $500 so he can have affordable insurance at $50, I am still paying for his care.